Welcome to the blog for the Freight Car Department at the Illinois Railway Museum. Here you will see updates on projects, maintenance and repair schedules and news on pending or proposed acquisitions. Also, our department seems to be the defacto manager of the IRM Woodshop. Stay tuned for notes on projects that include making piles of sawdust. Our department also does a lot of the artwork and lettering for our restored cars, and in addition to freight cars, has included electric cars, internal combustion, steam locomotives, and steam passenger cars. You may see some of this work posted in the blog. The images on these blogs are 'thumbnails' only, but if you click on them with the left mouse button, you will see the full image. If there is a project you are interested in, please contact me and we will try to get pics/updates of work our dept may be doing in that area. To take advantage of the info elsewhere on the IRM website you will also see links to other areas of interest. In the morning Victor Humphreys was acting as the “catcher’ while Buzz Morrisette was ripping new timber for repairs on the private car, ELY. Jim Leonard was on hand and promptly went to work priming more wood for the interior of our Chicago Great Western X 38 snowplow. Bill Peterson and John Fualhaber are seen expertly slicing tenons, seventy two cuts, for new passenger car windows. This is the stage where precision begins to pay dividends. In the next phase, sets are matched and numbered and each set gets hand fit for gluing. In other work, Victor and I completed fitting two more windows for the cupola for the Pennsylvania Railroad wood caboose (and glued them), Bill P. and Bob Sundelin made progress on milling new wood carlines for the Union Pacific M-35 doodlebug, Tim Peters continued on the Chicago Rapid Tranist 1024, and several volunteers worked to staff the inaugural day of the Happy Holiday Railway. It was certainly cold enough to be the North Pole although the ground remained bare. In posting this entry I just checked the webcams and it is much more wintry and white today. WOW! Bill Peterson and I walked out the the Chicago Great Western X 38 snowplow to see about the work being done on installing the new ceiling inside it. Here, Bill looks on while Victor Humphreys and Jim Leonard fit another board. As you can see they are within sight of the finish line. At this stage almost every board has to be trimmed, notched, or otherwise fit around supports and other features. And of course to prepare for these steps, there is the invisible work in the shop. Almost every work day, Victor primes more new boards so they will be ready. While winter has arrived, if the weather does not get too bad and there is little snow cover, look for this stage to be finished by the end of the year. I suppose I should not have said that - predictions are almost always the kiss of death. We continued to work on new windows in the shop for our Pennsylvania Railroad wood caboose. Bill Peterson was introduced to the fussy work of custom fitting each joint for a new sash. In between other work, John Faulhaber took on sash number three and worked on one joint at a time. After lunch two were done pretty well, and we proceeded to set up the glue press and do the final assembly. We started these about two weeks ago and two are assembled already! Of course these are pretty simple compared to some sash we have tackled. Tim Peters continues to work toward making two new roof mounted sign boxes for Chicago Rapid Transit 1024. The originals were removed by about 1914 so these are all new fabrications based on photos and evidence left behind on the roof and carbody. I mentioned John Faulhaber was doing other work. Early in the morning he could be seen at our mortiser machine plunging square holes into stiles for new passenger car windows. These are old machines and a flat leather drive belt finally separated and broke. John and Rod Turner crafted a replacement and by later in the day, the machine was back in service. I would like to wish all our members, friends, and supporters a Happy Thanksgiving. That would extend especially to our volunteers, shop workers, and restorationists who work year around freely giving of their time. What a great crew of guys. THANK YOU!!! We had a light turnout yesterday in the shops, and the weather was really too cold to work outdoors. But several diehards came out and made some progress on many projects. 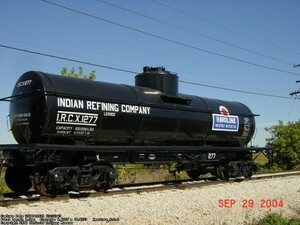 I will start out with a current photo of the largest tank car in our collection, Great Northern X-1390. We managed to get it repainted this fall and have begun the lettering. It is fairly unusual in the orange dome and patch on the tank shell. Presumably this made it easier for yard crews to pick it out from a sea of tank cars. John Faulhaber is trimming all the top and bottom rails for new windows to exactly the same length. Then he made stop cuts for tenons (144 cuts) on the top and bottom rails of new passenger car windows that he and Paul Cronin are making. In the morning we went over the engineering drawings and they measured and marked for all the mortises to be drilled into the stiles. Victor Humphreys and I continued work on new cupola windows for our Pennsylvania Railroad four wheel wood caboose. We completed the mortising and have done the rough fitting on the first of the new frames. Norm Krental was busy working on a headlight for Michigan Electric 28. With the new canvas roof completed and painted, maybe we can all look forward to seeing the headlight restored and mounted on the front roof of the car. Let the sparks fly!! Incredible as it seems Jeff Brady is working to dis-assemble a set of roof boards for the Michigan Electric 28. The car probably last ran over 75 years ago and yet here is an original set of these. True, the saddles are pretty much rotted away or broken, but some other parts may be able to be saved (that is their plan and they sticking to that story). So the rusted bolts are being cut away and thus the nice rooster tail of sparks flying against a temporary shield.